If you have been searching for a Hobbit wooden-dollhouse we have made it for you! 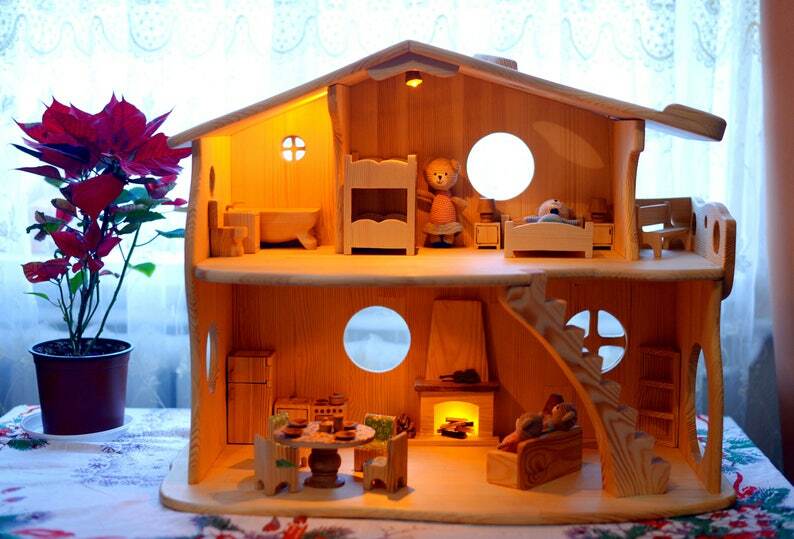 This two-story Wooden dollhouse with furniture - 100% handmade, space for several children to play together, and charming details, such as the hand-carved central stairs and fireplace, in the house with light, the fireplace has a little lamp in it so it actually looks like there is fire. Height 55cm/23in , length 70cm/27,5in, depth 35cm/14in . The height of levels (between a floor and a ceiling) 25cm/10in. the height of the windows 6cm/2.4in. We recommend not to leave children under 2 years of age unatteded, for safety reasons. Our illuminated hobbit house arrived in perfect condition. It's a masterpiece. Better than expected. My grandchildren are thrilled and play with it constantly. They are going to love it for years to come. Thank you for this beautifully crafted doll house.